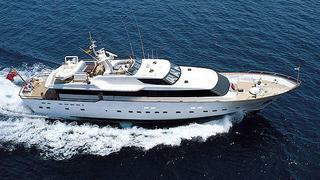 A call to Camper & Nicholsons confirms that Jonathan Syrett has sold the 33.5m motor yacht CD One. Aluminium-hulled, CD One was built by W.A. Souter & Sons in 1985 to a design by Don Shead. Accommodating 10 guests in four en-suite cabins, the interior underwent a total refurbishment in 2000/2001 and the light and airy colours give a feeling of space and relaxation. CD One boasts a huge aft deck area and three separate dining areas give plenty of choice whatever the weather or mood of guests. The upgraded control system for the stabilisers ensures safe and comfortable cruising.